The argument is simple, appealing and wrong – it makes two important mistakes. Firstly, it confuses correlation with causation. 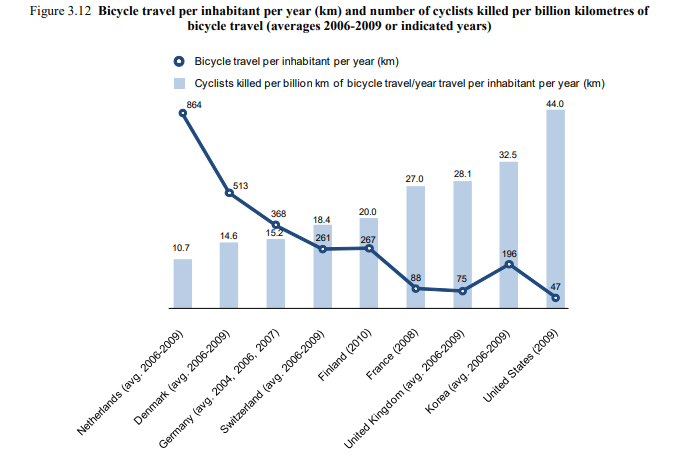 Did the increase in rider numbers really cause the fall in the death rate? Or was the fall in deaths just associated with increased rider numbers, and was actually caused by something else? Secondly, the argument ignores the reasons why more people do not ride bikes. As the original OECD report pointed out [p. 57-8] increased rider safety could be due to a range of explanations, including that cycle-safe traffic systems attract more cyclists. Rather than ‘safety in numbers’ this is more like ‘numbers through safety’. Improving safety for bike riders causes the increase in numbers – not the other way around. To understand what’s really happening we need longitudinal studies that measure cycling behaviour before and after safe, separated infrastructure is built. If we don’t ask what causes increased rider numbers, we risk sabotaging the safety and interests of bike riders. Building safe, separated infrastructure requires sustained investment, effort, and a change in road priorities, that have historically favoured motor vehicles. Campaigns telling people they should ride more often are far cheaper, but unlikely to persuade the 70% of people who say that safety issues and convenience are their reason for not riding. The ‘safety in numbers’ argument holds some weight in that drivers who see people riding bikes more often become more accustomed to driving around them. Unfortunately seeing more people riding bikes is no guarantee drivers will behave more safely, especially if social norms, road infrastructure and speed limits remain unchanged. Build it for Everyone - invest in delivering safe, separated cycling infrastructure that is suitable for people of all ages to use. Painting a line that creates a ‘bike lane’ in the door-zone beside parked cars or bike diagrams on busy roads is inadequate. This sends the message that the safety concerns of potential riders, the needs of children, parents and elders are being ignored. “We need bike riding infrastructure that is safe and convenient for everyone to use,” said Bicycle NSW CEO, Alistair Ferguson. Expecting rider numbers to increase, or road safety to improve with inadequate provision for safe cycling is ‘magical thinking’ that has failed, and is contradicted by data. The City of Sydney and City of Parramatta have shown that when safe, separated bike infrastructure is built, bike riding rates increase, including more women riding. Bike share companies have demonstrated that more people ride bikes when they are placed in convenient locations. “Bike riding can help people stay healthy and reduce congestion, but NSW participation is falling because governments are failing to provide for riders,” said Alistair. Significant, sustained investment in bike infrastructure that is safe for all riders – from young children to elders – has worked overseas to increase safe cycling participation. ‘Nirvana’ needs infrastructure to be built, because road safety for riders does not happen by magic. Riding to work can transform a boring commute into an economical, healthy, time-saving exercise. How that trip ends can make all the difference to you starting your day well and continuing to ride in future. Most riders will need somewhere to shower and change, a safe place to store their bike during the day and somewhere to put bags of cycling clothes, towel and toiletries during the day as a minimum. People will avoid riding to work if facilities are not provided. They will also be deterred if what is provided is dirty, inconvenient or insufficient for people to use them and get to work on time. Many companies in Sydney pride themselves on end-of-trip provision, offering fresh towels, beautiful facilities, toiletries, places to iron clothes – an experience that reminds you of a high end gym or spa to ease you into your working day. Five At Heart estimates that companies in the City of Sydney alone have spent $57 million on end of trip facilities in the past ten years. If you work in a large building it’s worth asking the building manager what facilities exist. They may have been set up by another tenant, but your manager might be able to negotiate access. If your workplace doesn’t have end of trip facilities, but there is a nearby gym or pool, that could be a good alternative. Your manager may be able to negotiate a corporate package. “The advantage for managers is that people who ride a bike to work usually have predictable travel times, and aren’t held up by congestion or breakdowns on roads or public transport. 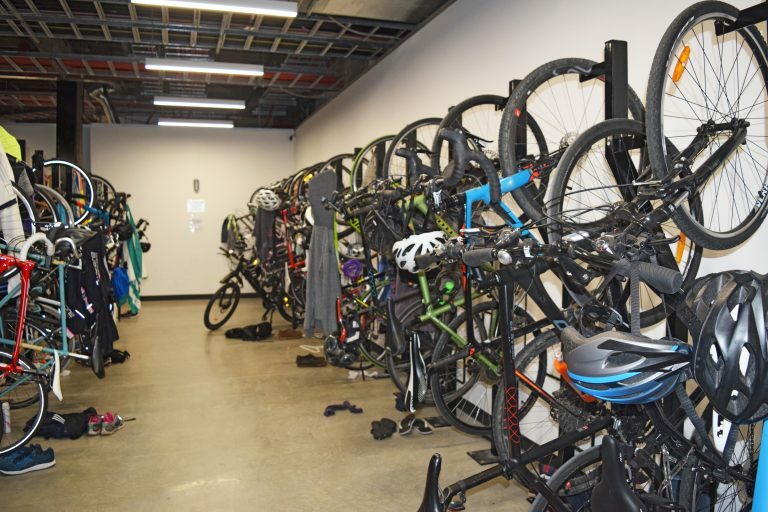 It’s worth providing for these staff so your business keeps running smoothly,” said Bicycle NSW CEO, Alistair Ferguson. Bicycle NSW encourages managers of organisations to provide end of trip facilities for staff riding for work as these help increase the travel and business resilience of your team. It has also been shows that people who engage in strenuous physical activity at least three times a week have lower levels of sickness absence.